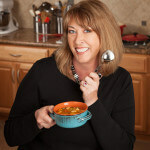 Hey Jenny thanks for sharing another yummy recipe from Bowl Me Over, I appreciate the opportunity to stop by! 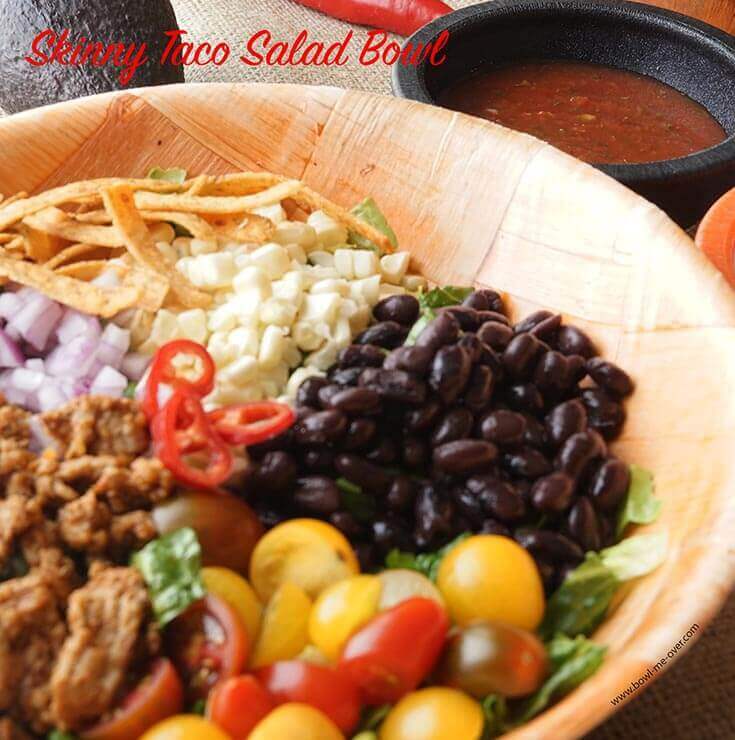 Today I want to share with you one of our go-to meals – a Skinny Taco Salad Bowl. I love this meal, it’s one we enjoy here at the house all the time! Fresno is well known for having GREAT Mexican food! But if you’re like me, going out can be hard on the budget and um….well hard on the figure too! 😀 So when I get a craving, this is a bowl we really enjoy. In fact my 13 year old niece is visiting us this week and she loved it too, so I’m gonna tell you this is definitely a family friendly meal! Of course you can substitute with a packet of prepaid taco seasoning. Next, chop some lettuce – for this salad I like using a nice crunchy romaine! Drain and rinse black beans. Cherry Tomatoes – just sliced in half. Two ears of fresh corn – kernels removed. Add a small handful of tortilla strips or chips to give it great crunch! Lastly, the dressing. 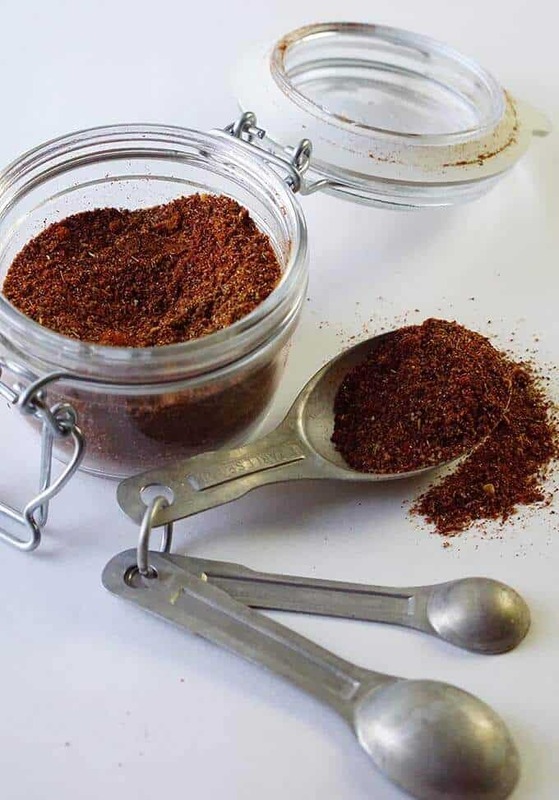 It is super easy – greek yogurt mixed with your favorite salsa! Of course there are many other additions you can add like olives, guacamole, jalapeños and sour cream, but like I said at the beginning – this is a Skinny Taco Salad Bowl, quick too! I’m just keeping this bowl easy, lean and delicious! This meal easily makes four servings. Since there’s only two of us here I’ll serve this one night, wait a day and serve it again or if you’re looking to splurge, you have everything you need for a great pile of nachos on Friday night! Slice the tomatoes in half, dice the onions, rinse the black beans really well and allow them to drain. Remove the kernels from the corn. 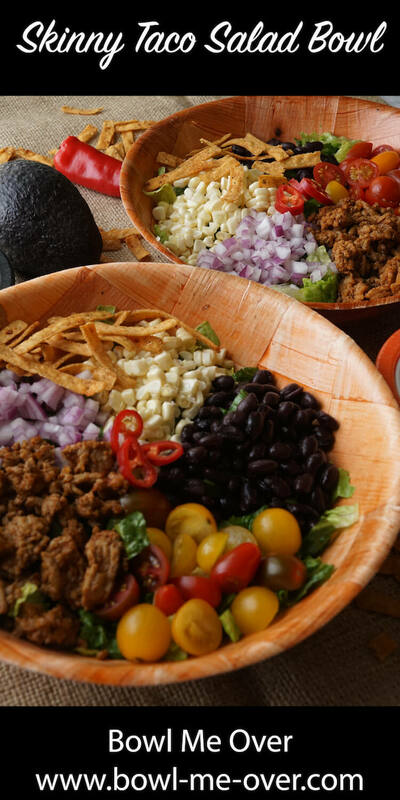 Add these ingredients to each salad bowl equally, topping with the taco meat. Love this bowl? Here’s another tasty option! 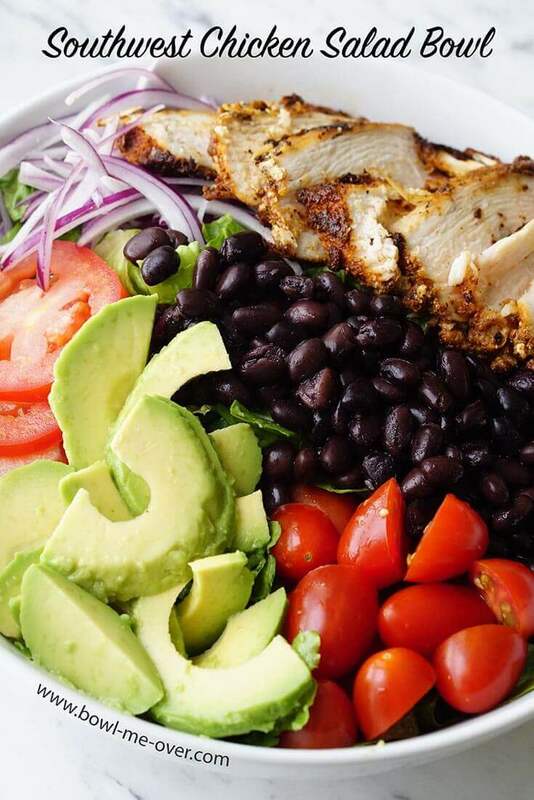 Southwest Chicken Salad Bowl with Cilantro Lime Dressing – super light and healthy, really delicious! Don’t forget to head over to the blog for more yummy recipes!